Plus, fall means soup weather is here! And chili weather! And . . . GRANOLA weather! It hit me this morning that I’m due to develop a new granola recipe. Here’s an oldie but goodie, my Pumpkin-Raisin Granola recipe, if you are looking to bake up some of this homemade staple this week. Yummm. Even though cozy comfort food is officially back, I’m not ready to let go of all of my summer staples. 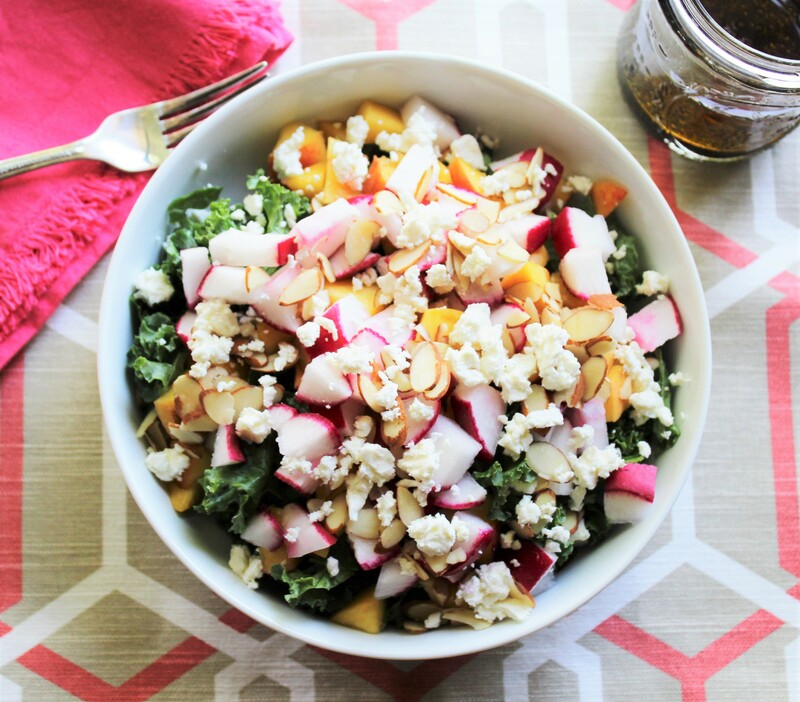 This peach, radish, and kale salad has been my obsession for the last month at least. It’s got everything you need in a good salad: savory, sweet, crunchy – and CHEESE. Feta cheese, to be exact! I love feta because it doesn’t take a lot to be flavorful. It and the radishes add a great bite to the salad that are a perfect counterpoint to the sweet peaches and balsamic vinaigrette dressing. The dressing for this salad, a simple combination of balsamic vinegar, olive oil, and pepper, is the same dressing I used in my last recipe post, the equally delicious Strawberry-Peach Balsamic Spinach Salad with Pulled Roasted Chicken. Two salad recipes in a row from a girl who spent most of her life hating salads – go figure! Turns out I just had to discover the greens that were right for me (I’m not an iceberg lettuce kind of gal). Speaking of greens: I use curly-leaf kale in this recipe. Tuscan kale works equally as nice. If you are feeling especially frisky, you can massage your kale. Some people find it a bit too thickly textured for their liking au naturel. If you are one of those people, then massaging the dressing into the kale for a minute or two with your fingers can be beneficial in tenderizing the leaves. I massaged my kale the first few times I made salad with it, but then I got lazy. Honestly, I think the kale leaves taste great as is. And of course, if you are not fan of kale, you can use another green, such as spinach. Now, on to the recipe! This will make one generous serving of salad, so it’s a perfect lunch-on-the-go recipe. You can always multiply it if you are looking to serve more. The vinaigrette portion of the recipe will yield dressing for multiple servings; it keeps well in the fridge. 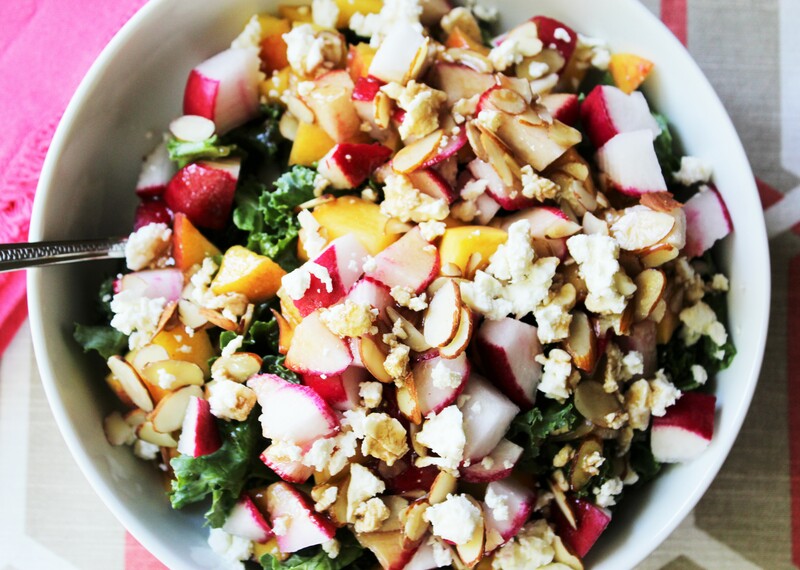 Add the chopped kale to a bowl and layer the peach, radishes, feta, and sliced almonds on top of it. To a container with a lid, such as a mason jar, add the olive oil, balsamic vinegar, and black pepper; shake well. Drizzle as much dressing on the salad as you’d like. Makes one generous serving of salad. The excess dressing should keep well in the fridge for a week or two. Enjoy!